Here's my Christmas gift to the church - the shortest sermon I've ever preached. I presented this before our choir presented their Christmas music. Merry Christmas! Last Sunday, I told you if you checked this site, there would be some information regarding some prominent teachers and leaders in the modern church whom I fear are confusing many believers. The post I was referencing had to do with Senator Grassley's investigation into prominent prosperity gospel teachers. You can search online for Senator Grassley and the investigation and find many references and opinions. I'm not going to get into the financial integrity of these individuals. I've linked an article from Charisma Magazine on a previous post that sums it up pretty well. However, this idea of confusing theology or misteachings is becoming an issue. If you will go to the website for the Watchman Fellowship (http://www.watchman.org/) you can read articles and see video clips regarding some in what has become known as the "Word-Faith" movement. You can search for Word Faith Movement and will come up with a list of prominent leaders who fall into this category. Be discerning. I've been talking about giving and debt management the past few weeks. Here's a brief video that explains it better than I ever could. A sure thing? A guarantee? It's so hard to believe in these nowadays. The truth is that the value of a promise is based on the one making the promise. Christ gives us many promises. His guarantees always come true. Today I'm talking about another gift in this series titled "The Ultimate Gift." This is the gift of giving. The simple truth is that as you give, so it will be given to you. Take a listen. Last night, all across the nation, and especially in the southeast, people were anxiously watching as four young men waited patiently to hear if they had been awarded the coveted Heisman Trophy. Since my wife is an avid Arkansas Razorback fan, there was a desire to see Darren McFadden, who came in second last year, win the award this year. We know that due to the coaching changes at Arkansas and his professional playing prospects, he will not be playing college ball next season, so this was his last chance. Chase Daniel of Missouri and Colt Brennan of Hawaii were there also, but everyone knew they were just along for the ride. The story was Tim Tebow, the sophomore quarterback from the University of Florida. He's been called Superman by the media all season, and after watching him play and looking at his stats, it's easy to see why. He's truly an incredible football player. Since the guidelines for the Heisman are that the "most outstanding college player" is to receive it, he fulfilled the criteria. The only caveat was that he is a sophomore. No underclassman had ever won the award until last night. Then, the moment happened. Tim Tebow's name was read. His speech focused on his priorities in life: Christ, family, academics and football. His sincerity was obvious and I think he named and thanked everyone he's ever met. It was a good moment. I'm not a Gator fan, though I'm not "anti-Gator" either. I like the SEC and was proud that two of our guys were there. After it was all said and done, I felt bad for McFadden, but I imagine he'll be OK once he signs his NFL signing bonus. Tim Tebow - used to be called "Superman." Now he can be called Super"Heis"man. Maybe more appropriately Super "His"man in that he claims and appears to live as His man. . .God's man. Are you familiar with Senator Charles Grassley's (R-Missouri) current investigation into high profile Christian ministries? According to Yahoo! News. . .
Grassley, the ranking member of the Senate Finance Committee, sent pointed questionnaires in early November to a half-dozen ministries, asking about salaries, perks travel and oversight. the Iowa Republican set Thursday (December 6) as the deadline for a response. All six organizations preach a form of the "prosperity gospel," the belief that God wants his faithful followers to reap material rewards. These ministries include such popular preachers and speakers as Creflo & Taffi Dollar, David & Joyce Meyer, Kenneth & Gloria Copeland, Eddie Long, Benny Hinn and Randy & Paula White. All ministries listed here are prominent "prosperity gospel" teachers. While many in the evangelical community have long discounted their methods and teaching, even those in the charismatic fold are now questioning some of the perks and lifestyle choices. First, the reality is that many evangelicals are finding themselves reading the books and listening to the teachings of these leaders. Take away the possible misappropriation of funds and you still have a teaching based on sketchy theology. J. Lee Grady, editor for Charisma Magazine, which runs articles and advertising for most all of these teachers and others, has written a great editorial regarding the Grassley investigation. Where you might think Grady would condemn the man, he actually applauds him for doing what the church should have been doing for years - holding their leaders accountable. Previously, i had posted Grady's article, but continued to have formatting problems in this blog. So, go to www.charismamag.com/fireinmybones/columns/show.php and click on the editorial titled "Integrity, Accountability and the Grassley Investigation" dated 11-09-2007. I think Grady is right on in his take. Well, Governor Mike Huckabee just surged ahead in the Iowa Republican polls. According to news reports, he had been moving up steadily, then he aired this commercial with Chuck Norris. In case you didn't know, Chuck is a member of Prestonwood Baptist Church in Dallas, Texas. 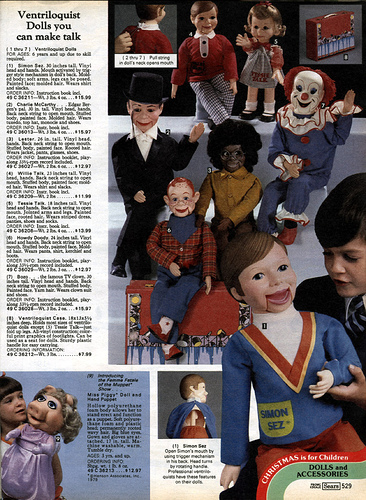 I remember as a kid wanting a Charlie McCarthy ventriloquist dummy for Christmas. It was the one gift I kept circling in the Sears Wish Book. Finally, I opened that box, and there he was. As great a gift that was (or at least I thought so,) there are other gifts I've received throughout life that couldn't be wrapped up or given as a present. They were given by my parents, teachers, coaches, pastors, and most of all God. He has given us gifts to help us become who He has designed us to be. When you think of work, you probably don't think of it as a gift, but it is. God has given us this gift to teach us and to help us become the men and women he's called us to be.